A new trend in gardening is the development of small bushes that fit nicely into tight spaces– some are even suitable for containers! These new varieties preserve the characteristics we enjoyed in the larger versions. 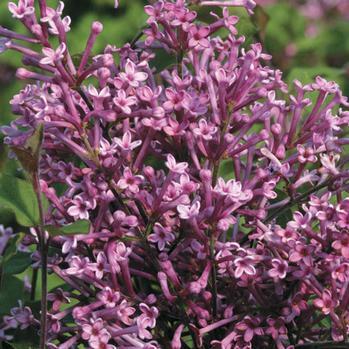 One example of a smaller bush is ‘Bloomerang,’ a very fragrant reblooming lilac introduced two years ago that grows only four or five feet tall. That’s not like your grandmother’s lilac, which might have gotten 10 feet tall, said Mark Van Buren, owner of Zehr’s on the Lake. Some of the dwarf varieties of plants had lost their fragrance, but plant propagators have done genetic retweaking to regain that fragrance, he noted. Another trait gardeners are looking for is getting as much bloom as they can get. Some plants, like the ‘Bloomerang,’ rebloom, while other plants have an extended period of bloom. 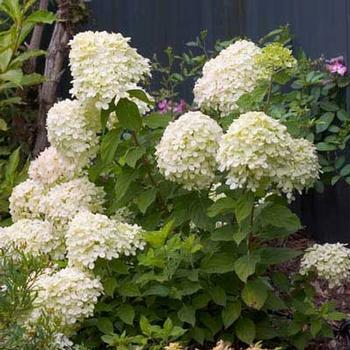 The hydrangea ‘Invincibelle Spirit’ delivers in the bloom department in a different way: It packs large blooms on a small plant. ‘Invincibelle Spirit’ was new last year. It’s the traditional snow bush ‘Annabelle’ with pink flowers. It grows three to four feet tall and attracts butterflies and hummingbirds. Unlike many hydrangeas, the flower buds are produced on new wood, so it will produce flowers even if the stems die back to the ground in extreme weather. ‘Little Lime’ is an extended bloomer. Summer flowers open soft green and turn pink and burgundy in fall. It blooms on new wood. 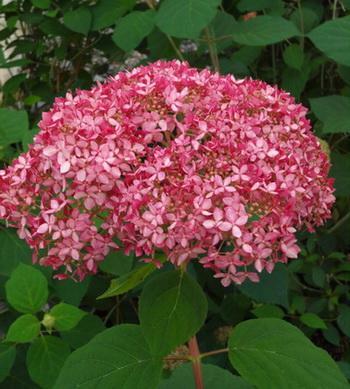 The Let’s Dance Series of reblooming hydrangeas adds a new introduction this year. ‘Let’s Dance Big Easy’ joins ‘Let’s Dance Moonlight’ and ‘Let’s Dance Starlight’. These reblooming hydrangeas grow on old or new wood. All grow two to three feet tall. The blooms on ‘Let’s Dance Big Easy’ go through a wonderful progression of color changes, from pink/green to pink, and often back to green. The color ranges from rich pink to blue depending on the acidity of the soil. 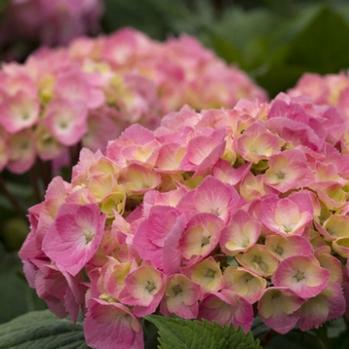 Some of these new varieties of shrubs are small enough to grow in containers. The miniature butterfly bush (buddleia) Lo & Behold ‘Blue Chip’ is a miniature flowering shrub released two years ago. 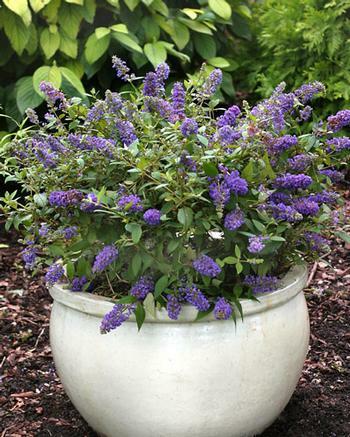 It grows only 24 to 30 inches high, while other varieties of butterfly bush can get six feet tall! Though it’s small, it still attracts butterflies and hummingbirds. (It’s also deer resistant.) It blooms from the middle of summer through fall. If you want to keep it in a container over the winter, you need to offer it extra protection. It’s okay if the plant freezes, Van Buren said, but you want to protect it from large swings in temperature. When the small plant is in a container, it’s more difficult for it to adapt when the temperature is 50 degrees one day and 10 degrees the next. To help protect it from those wild swings in temperature, you can keep the container in an unheated garage. Or, if you keep the container outside, you can throw a blanket over the plant and container. 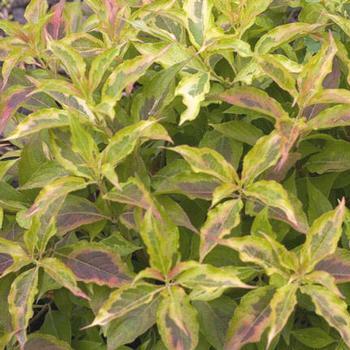 Another specimen you can grow in a container is the weigela ‘My Monet Sunset’, which grows only 12 to 18 inches tall. It’s a small version of the popular ‘Monet’ weigela. It can be used as you would use a low mounding perennial or annual, or use it en masse as a ground cover. It has colorful, varigated leaves that turn red in the autumn. It will occasionally produce soft, rosy pink flowers. ‘My Monet Sunset’ attracts butterflies and hummingbirds.